Since opening in 1975, the Mercedes-Benz Superdome has played host to a multitude of events that have captivated audiences around the world. Continual upgrades of amenities and technology infrastructure have made the Superdome one of the world’s most advanced venues – and it will remain a top contender for prominent national and international events for decades to come. 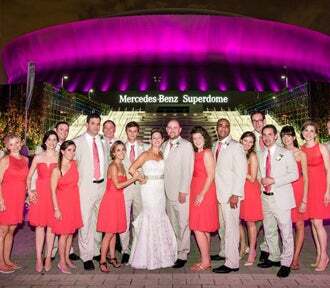 However, big events aren’t the only experiences the Superdome has created for its clients. The iconic, multipurpose venue adapts as needed, and in an instant can become an intimate environment perfect for general sessions, exhibits, special events and more. The square footage of the Superdome is a canvas to accommodate any event large or small, with a reputation for greatness that is unmatched. To research date availability or to receive a customized proposal, please contact the Sales Department at (504) 587-3663 / (800) 756-7074 or email us. Centerplate is the exclusive caterer for the Mercedes-Benz Superdome. Its highly trained and award winning culinary team invites you to experience superior cuisine artfully blended with innovative presentation and style. Click here for additional information.